The recent discovery of a “Superhenge” near Stonehenge has renewed interest in England’s favorite prehistoric monument. You know what Stonehenge looks like and have probably heard the speculation about its purpose, but how well do you know the UNESCO World Heritage Site? 1. ITS CONSTRUCTION WAS A 1500-YEAR PROJECT. While many questions about the who, how, and why of Stonehenge’s construction linger, scholars have a fair idea of when the massive monument was built. The oldest elements date back to around 3000 BCE, when a ditch 6 feet deep was dug in a field to form a circular enclosure. The signature stones started appearing around 2500 BCE, and the erection and rearranging of bluestones and digging of additional holes may have continued until around 1500 BCE. 2. THERE’S A SPECIAL VOCABULARY FOR DISCUSSING THIS SORT OF MONUMENT. Within Stonehenge, there are two main types of stones. The large verticals and arches are made of sarsen, a type of sandstone that is common in the region. The smaller stones are known as bluestones. While they’re not all that blue, they appear to have a slight bluish tint when they’re wet. The giant three-piece arches for which Stonehenge is known are called trilithons. 3. SOME OF THE MONUMENT’S STONES MAY HAVE TRAVELED OVER 150 MILES. When it was time to buy construction supplies, Stonehenge’s Neolithic builders didn’t buy local. Some of the monument’s smaller bluestones—which can still weigh up to four tons—have been geologically linked to the Preseli Mountains in Wales. While not everyone agrees, most modern scholars think that these giant stones had to be moved 150 miles to become part of Stonehenge. The methods through which these stones made the trip is one of Stonehenge’s great mysteries, with theories including everything from rafts to teams of oxen. 4. IN ITS EARLY DAYS, STONEHENGE WAS A CEMETERY. Although Stonehenge’s full purpose is still shrouded in mystery, anthropologists can say with certainty that in the period before the first large stones appeared, the monument served as a resting place for cremated remains. The 56 pits or “Aubrey holes” in the area are now known to have housed the remains of at least 64 Neolithic people. 5. IT ALSO HOUSED A LATER SET OF REMAINS. For most of modern history, all of the human remains discovered at Stonehenge had been in ashen form. In 1923, however, archaeologists discovered a decapitated Anglo-Saxon man from the 7th century CE. The man’s beheading suggests he was an executed criminal, but his burial at Stonehenge may indicate that he had previously been in a position of power, possibly even a royal one. 6. SPECULATION ABOUT ITS PURPOSE HAS RUN WILD. 7. THE FIRST WRITTEN RECORD OF STONEHENGE CAME IN THE 12th CENTURY. 8. 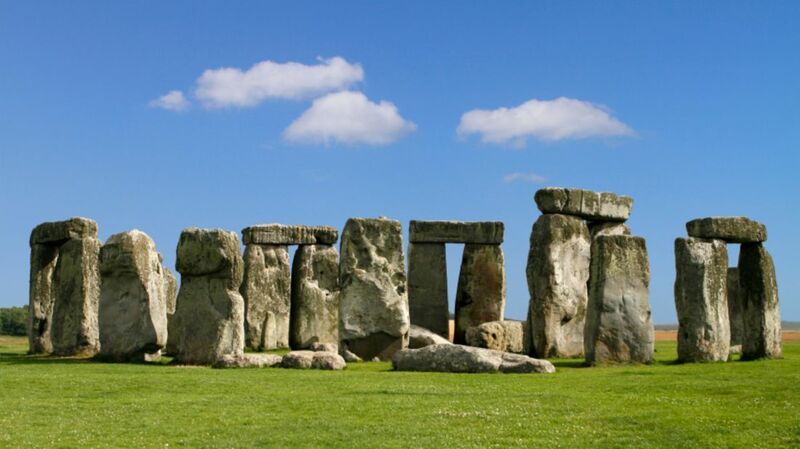 DURING MEDIEVAL TIMES, PEOPLE BELIEVED THAT MERLIN THE WIZARD CREATED STONEHENGE. Observers have been speculating about the origins and purpose of Stonehenge for centuries. In the absence of any more convincing theories, Medieval Britons sank their teeth into an unlikely proposition set forth by Geoffrey of Monmouth, a cleric and historian responsible for a good deal of British lore. Geoffrey proclaimed that the mysterious monument was the work of legendary wizard Merlin. The outrageous claim remained a trusted hypothesis for centuries. 9. ANOTHER POPULAR MYTH GAVE CREDIT TO THE DEVIL. Wizardry wasn’t the only farfetched explanation that found traction. The mystery surrounding the bluestones’ transportation from Wales to Wiltshire prompted a second paranormal explanation: They were put there by the Devil in a simple act of provocative mischief. The nearby Heel Stone, also known as the Friar’s Heel, was allegedly chucked at a combative friar by the Devil, sticking permanently in the ground upon impact. 10. A GROUP OF NEO-DRUIDS USED STONEHENGE FOR A DRUNKEN RELIGIOUS CEREMONY. In 1905, a collective of neo-Druids reclaimed the grounds in the name of their ideological ancestry. The 700-man group, operating under the banner of the century-old Ancient Order of the Druids, orchestrated an elaborate induction ceremony, complete with wizard-like robes, fake beards, and a massive amount of alcohol. Unsurprisingly, the contemporary print media gleefully ridiculed the event. 11. VISITORS USED TO BE ALLOWED TO CLIMB ON THE STONES. It wasn’t until 1977 that the mounting of Stonehenge’s rock structures became explicitly prohibited. The decree followed significant erosion of the stones from their human interactions. That may sound wild, but things were even crazier until the early 20th century—tourists were given chisels to facilitate souvenir-taking! 12. CHARLES DARWIN MADE SOME INTERESTING DISCOVERIES BY STUDYING EARTHWORMS AT STONEHENGE. In the later part of his life, Charles Darwin turned his focus to the humble earthworm, publishing the catchy The Formation of Vegetable Mould through the Action of Worms just a year before his death. A section of the book was devoted to the renowned naturalist’s research at Stonehenge. In the 1870s, Darwin studied the endemic earthworm population to convince the world of their important role in nature, which included causing large stones to sink into the ground. His work was among the earliest in modern scientific excavations of Stonehenge. 13. STONEHENGE USED TO BE A COMPLETE CIRCLE. After spending years debating whether Stonehenge was ever a complete circle, archaeologists got help solving the mystery from an unlikely source: A 2014 drought. When conservators didn’t have a long enough hose to water all of the grass around Stonehenge during a drought, they began noticing odd, patchy marks in the turf. The areas pointed at the position of stones that had previously been present or had been buried over the centuries and seemed to settle the question of whether Stonehenge had once been a circle. 14. AN AVERAGE CIVILIAN OWNED STONEHENGE FOR THREE YEARS IN THE 1910s. Stonehenge has been the legal property of the British state for most of the last century, but it might never have fallen into the government’s hands if not for the charitable impulses of Wiltshire native and wealthy jack-of-all-trades Cecil Chubb. In 1915, the former student teacher, lawyer, racehorse owner, and city councilman bid on the Stonehenge land, newly up for auction following the death of the last surviving representative of the Antrobus family. Three years after his £6600 purchase, however, Chubb decided to donate the historic land to the state on the condition that it be dutifully preserved and remain open for public visitation. Chubb got a pretty sweet thank-you in the form of knighthood. 15. YOU CAN MAKE YOUR OWN BID ON STONEHENGE THIS FALL. On the centennial of Chubb’s momentous real estate purchase, English Heritage is offering an interactive reenactment of the 1915 auction called “Sale of the Centuries.” In the last week of October, visitors can bid along as the icon goes back on the auction block.